You can modify query properties in Excel by right-clicking any cell in an existing query range and selecting Data Range Properties. 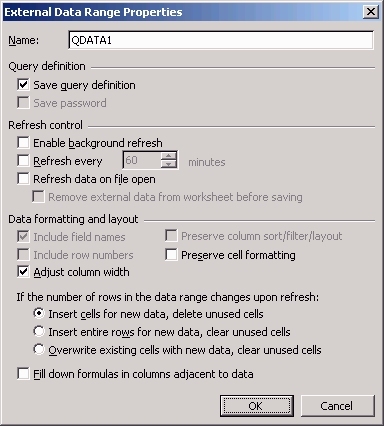 This option opens the External Data Range Properties dialog box, as shown in the following image. Name. You can change the name that is automatically assigned to the named range. WebFOCUS Quick Data automatically adds a named range to the entire data table and also to each individual column. Named ranges are useful when referring to data as a source for analysis or within an advanced Excel application. Query definition. You can save the query definition and, if applicable, you can save the password. Refresh control. You can enable a background refresh, set the refresh interval, and enable the file to refresh data when opened. If applicable, you can also remove external data from the worksheet before saving.